Diabetes is a group of chronic inflammatory diseases that affect the body’s ability to process sugar. If you have diabetes, it is particularly important to maintain excellent oral health. That’s because diabetics are more prone to oral infections such as periodontal (gum) disease, which can result in tooth loss if left untreated. 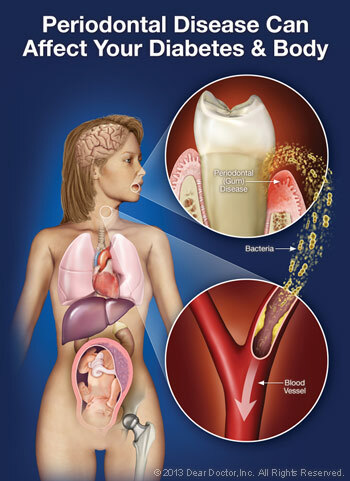 Conversely, the presence of gum disease can make it harder for people with diabetes to control their blood sugar levels. Periodontal disease is a chronic ailment that is also associated with an elevated level of systemic (whole-body) inflammation. Like diabetes, it may have wide-ranging consequences outside the mouth — possibly increasing a person’s chance of experiencing major cardiovascular events (such as heart attack or stroke) or adverse pregnancy outcomes (low birth weight and pre-term delivery). So perhaps it’s not surprising that a growing body of evidence suggests the two diseases are related. It has long been recognized that having diabetes is a risk factor likely to increase the severity of periodontal disease. That’s because diabetes reduces the body’s resistance to infection, making diabetics more susceptible to both bacterial and fungal infections. Likewise, evidence shows that having serious gum disease (periodontitis) is likely to result in worsening blood glucose control in diabetics; it can also increase the risk of diabetic complications. So, what’s the connection? While no one is sure at present, the two diseases seem to share some common pathways and disease-causing mechanisms. Both are associated with the process of inflammation and the immune response. Inflammation itself — often signaled by pain, heat and redness — is evidence of the body’s immune system at work, attempting to fight disease, repair its effects, and prevent it from spreading. Chronic or prolonged inflammation, however, can lead to serious problems in different parts of the body and a decline in overall health. What does this mean to you? According to one large study, if you’re diabetic, your risk of dying from heart attack is over twice as great if you also have severe periodontitis — and for kidney disease, your risk is 8.5 times higher! Plus, uncontrolled periodontal disease makes it six times more likely that your ability to control blood sugar levels will get worse over time. So not only can having one condition put you at risk for worsening the other — having both can cause a significant deterioration in your overall health. While diabetes can’t be cured, it’s possible to manage the disease on a long-term basis. And here’s some good news: Clinical studies show that diabetics who get effective treatment for their periodontal disease also receive some significant benefits in their general health. 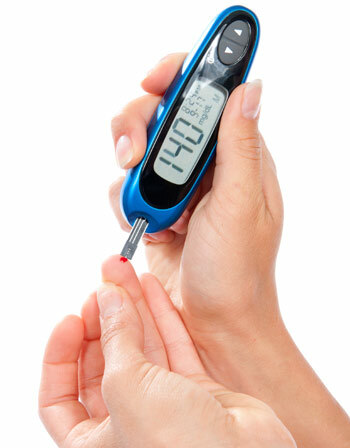 Many exhibit better blood glucose control and improved metabolic functioning after periodontal treatment. Likewise, if you’re at risk for diabetes but haven’t yet developed the disease, there are some things you can do to forestall it. While there is a significant genetic component, a major risk factor for diabetes is being overweight — so keeping your weight under control will better your chances of avoiding it. High levels of triglycerides or low levels of HDL (good) cholesterol are also risk factors. These may respond to changes in your diet — like cutting out sugary drinks and eating healthier foods. Also, high blood pressure coupled with an inactive lifestyle puts you at greater risk. Here, moderate exercise can help. When you come to our office, be sure to let us know if you’re being treated for, or are at risk of developing diabetes. And if you are managing the disease, remember that it’s more important than ever to maintain good oral health.